The constellation Libra. Roll mouse over to see labels. Libra is an equatorial constellation which culminates at midnight in May. The name ‘Libra’ is Latin for ‘scales’, making it the only one of the zodiacal constellations to be named after an inanimate object. It is a relatively late addition to the zodiac: until Roman times, this part of the ecliptic was assigned to Scorpius, the scorpion. 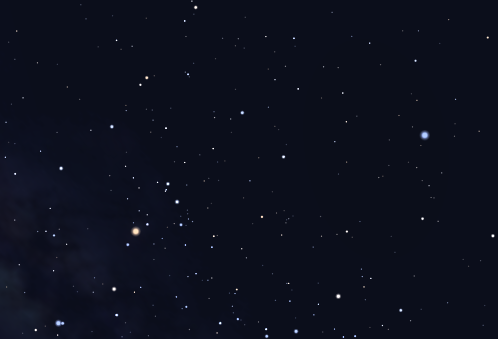 This is still reflected in the names of its two brightest stars, Zubenelgenubi and Zubeneschamali, Arabic for the southern claw and the northern claw respectively. In more recent times, Libra has usually been more closely associated with its western neighbor Virgo, the virgin, who is often depicted holding the scales of justice. Each year, the Sun lies in Libra for the first three weeks of November. Situated away from the plane of the Milky Way, Libra is home to only one bright deep sky object: the ninth-magnitude globular cluster NGC 5897. 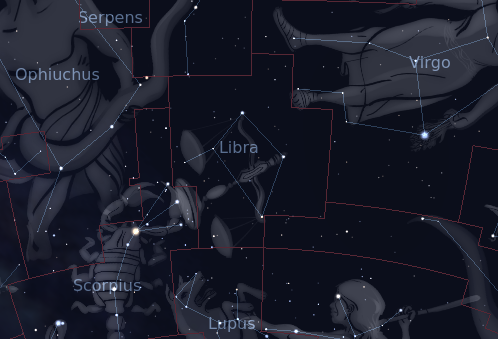 The following constellations neighbor Libra: Centaurus, Hydra, Lupus, Ophiuchus, Scorpius, Serpens Caput, Virgo.